NATO is building up its naval presence in the Eastern Mediterranean as the United States, Britain and France prepare to carry out new strikes against Syria under the pretext of an unlikely Syrian government chemical weapons attack in Idlib province. Warships from NATO’s 2nd Standing Maritime Group are patrolling Eastern Mediterranean waters, moving closer and closer to the Syrian coast, media reports said, citing Western websites monitoring naval activity in the region. 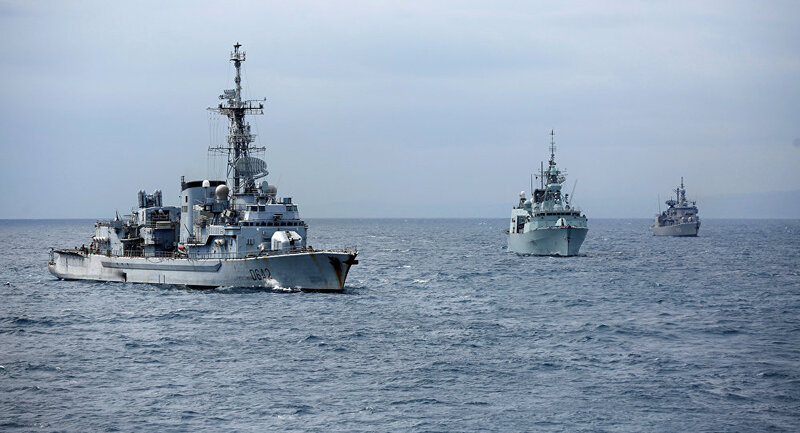 The NATO flotilla cruising off the Syrian coast reportedly consists of a Dutch frigate, the De Ruyter, a Canadian frigate, the Ville de Quebec, and a Greek cruiser, the Elli. This information was confirmed by the captain of the Dutch frigate in his microblog. According to earlier reports, a Los Angeles-Class US submarine, the USS Newport News, armed with Tomahawk cruise missiles, has entered the Mediterranean Sea to join a US naval task force consisting of two nuclear submarines with cruise missiles on board and two Arleigh Burke-class guided missile destroyers, the USS Carney and the USS Ross. Recently, the Russian military said that the militants are preparing to use chemical weapons in Syria, and the US could use this as a reason for a new attack on Syrian state facilities. The US, UK, and France carried out coordinated massive airstrikes on Syria in April 2018 after the alleged use of chemical weapons in Douma had been reported by the controversial NGO "White Helmets," which has repeatedly been caught staging false flag attacks.